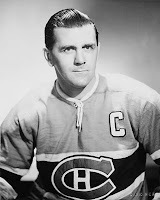 On March 23rd in 1944, Maurice "Rocket" Richard was awarded each of the game's Three Stars after his five goal Stanley Cup Semifinal performance, leading the Montreal Canadiens to a 5-1 win over the Toronto Maple Leafs. Upon being announced the game's Third Star, fans booed believing none had outperformed Richard that night. When the Rocket was called for the Second Star and then First Star, the Forum faithful applauded the historic moment. Only Maple Leaf captain Mats Sundin has replicated this feat earning all Three Stars at the ACC on October 11, 2007. Montreal won the series against Toronto 4-1 and beat the Chicago Blackhawks in the Stanley Cup Final claiming their first Cup in 13 years.